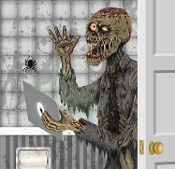 Hilarious bathroom door cover, featuring a modern Zombie perusing his tablet! Cover measures 30-inch wide x 5 feet tall (2.5 ft x 1.67 yd) (76.2cm x 152.4cm). Halloween Door Cover Zombie Sitting on the pot, giving it all he’s got! Ghastly Door Cover Restroom Design is plastic, so can be wiped clean. Attaches with your removable tape so it can be taken down, folded and reused year after year. Creepy Zombie also makes a weird gruesome refrigerator door cover, too .